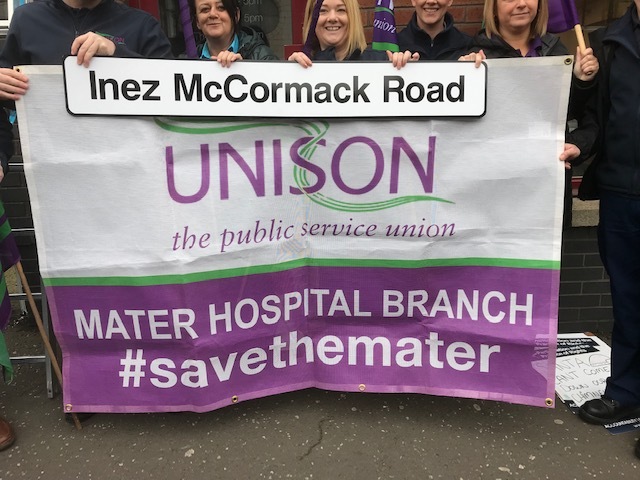 We celebrate Swan Day 2019 with the Street Naming in Belfast of Inez McCormack! A great woman leader in SEVEN! The March 2018 readings have come and gone–but get ready, because before you know it, the year 2019 will be upon us. Since 2016, we have had a yearly grassroots festival of readings every March, created by women all over the world. As part of March to MARCH, SEVEN has been performed in Washington, Florida, Indiana, California, plus in Canada, Japan, the U.K., and Bangladesh. Where will readings of SEVEN be performed in 2019? Get ready to organize your own reading or SEVEN event! And go ahead and partner up with SWAN Day! Why not put both events together and honor women! The entire month of March is International Women’s Month. Celebrate with SEVEN, the acclaimed documentary play that features 7 extraordinary women who have changed the world. Get ready for our 2019 March to MARCH! The March to MARCH is a grassroots movement to organize readings of SEVEN to inspire people worldwide to celebrate International Women’s Month by joining the campaign to stop violence toward women. How can I participate in the March to MARCH? Organize a reading with a local organization, theatre, library, office, school – anywhere. Read it once or launch a marathon. Create a big event or a small, intimate gathering. Get a group together and read the play aloud. Invite male colleagues to join you if you like. Read it at your book club. You don’t have to be actors or celebrities or have any experience in theatre. Anyone can act these roles. Give a shout out to friends in other places to create their own March to MARCH event. SEVEN celebrates remarkable women changing the world! How do I join? Send us an email (via our website) and let us know you’ve organized a MARCH reading or performance of SEVEN. We’ll list it on our special March to MARCH Facebook page and announce it on social media. Plus we’ll provide you with the purple 7 logo to use on your publicity and programs. While supplies last: We’ll have buttons for sale with our 7 logo on them! And after that? Send us your photos, send us a blog report, and we’ll put you on our News page on http://www.seventheplay.com. Your performances will become part of a growing archive that focuses attention on the struggles women endure everywhere. Are there royalties? For readings in your home or yard or workplace, where you’re not charging admission and the reading is among friends–not open to the public–there is no royalty fee. For readings open to the public, Dramatists Plays Service will license the play for a small fee based on a variety of factors including the size of the venue, the cost of the tickets, etc. You can contact Dramatists Play Service directly, or send us an email via Contact. Copies of the play are available through Dramatists Play Service. See our website—http://www.seventheplay.com–to view different ways that these shows have been done from Tokyo to Cuenca (Ecuador) to Delhi to Seattle! The women of SEVEN are associated with the Vital Voices Global Partnership; visit the VV website to see news of their activities.